(EX)-MÊKH eerder dit jaar werd aan mij de vraag gesteld om hun ‘Takes Five’-presentatie(s) te begeleiden met een geschreven commentaar. Mijn voorafgaande bijdrage in De Cacaofabriek in Helmond bestond uit het leiden van een ‘artists talk’ en het bleek al snel dat een aantal vragen vanuit die tentoonstelling mischien bij deze Take Five kunnen worden beantwoord en nieuwe ontdekkingen kunnen worden bespeurd. Ik zie deze rol van commentator voornamelijk als de verwoording als mediator tussen werk , kunstenaar en publiek . De rode draad zal met name worden gevormd door een persoonlijke tekstuele blik naar de ontwikkelingen en voortgang van deze presentaties. Daarnaast hoop ik ook favorieten, ontroering, vragen, verrassingen en eigen zelf-momenten te kunnen bemachtigen , die ik best wel eens met een publiek wil delen. Ik volg en beschrijf dan ook met grote afwachting en spanning al die ontwikkelingen en reacties die de kunstennaars zullen gaan maken in dit zeer afwisselend Take Five expositie programma in de komende weken. Mijn verhaal zal zich op een gegeven moment spontaan voortzetten in de Engelse taal mede daar deze nog steeds door diverse redenen als het eerste op het puntje van mijn tong ligt. Nu de groep (EX)-MÊKH met de eerste ‘Take Five’expositie weer is teruggekeerd in Den Haag , kenmerkt deze zich onmiddellijk door een heldere opzet en een thematische draad van gelaagdheid en zelf-reflectie. Ik wil niet eindeloos uitweiden over het verleden en de eerste ontwikkelingen en samenwerking , de conflicten en diverse uitdagingen aan elkaar en onderling tussen de individuele kunstwerken in de eerdere publieke presentaties die (EX)-MÊKH in de afgelopen jaren in een grondig zelf onderzoek heeft ondernomen . As they say the work and current presentation – speaks for itself. On first of all entering the exhibition space I am immediately struck by the clearity of this exhibition; the spatial layout, the light and the sound (*more on that later) all follow and emphasize the theme of reflection. My underlying and continuous question, what is the difference between a coherent thematic group show by individual artists, who are selected and brought together in a presentation to that of this collaborative group presentation is now partially answered by this decipherable maturity. The research and collaborative experimental process between all four (EX)-MÊKH artists, which preceded the current show, is demonstratively visible in this work. And not this time through literal interventions. But back again to the current show I was struck by the surrounding works of very layered self -reflective portraiture in various media and arts disciplines centered by (two) spatial construction(s) by Ellen Rodenberg assembled by her found, used and discarded consumer debris. The light gazing portraiture space is interrupted by the intermittent sound of church bells and a light continuous tropical soundtrack belonging to a not yet clearly seen video. A video by Ellen Rodenberg; an account of a journey, encounter of a challenging different culture framed within a modernistic art historical perspective and further barricaded by a towering ceiling height white polystyrene structure. The first pair off in the’Take Five’ intervention by Ellen and Kees Koomen is joined by invited guests G.J de Rook with photographic self portraits in which the artists blatantly looks at you from behind sunglasses and between two spread out fingers and states in total denial ever having been interested in contemporary art at all. Yet the photos participate beautifully in the self-reflection of the entire surrounding spatial works including the three theoretical and analytical mind-map works by Michiel van Soest. Portrait of self -awareness of exterior and interior, from visceral imagery to web browsed historical archive pictures of culture as we have seen it. Alongside the covered window in a light gray toned shadow, letters cut out, remind us that ‘Alles is schaduw’. (all is shadow). You still need objects or just things to cast the shadow and hence it is placed alongside and in this exhibition, when all has gone, the shadow remains for a while. The shadow of formative influence is painted by Kees Koomen and set on the floor in three portraits of those minds, who have helped him to face you now as an artist in a full frontal portrait. The surface is covered by dancing, rippling water and framed within a video projection. You are invited in yourself, who ever you are through the mirror placed by the side. The invitation continues in the other video projection by the artist in which the back of the head, one presumes of the artist, is seen in all stillness contemplating a close up shot of a green moving and waving landscape of rustling green leaves of a cherry tree. Life. Art. Interrupted by the occasional ringing church bells. The contemplator is unaware of your presence behind him and you can just step unheard and unseen into the picture. The self-portrait of the other invited guest artist Stijn Peeters is a large green figure dancing a grotesque prancing carnival dance. The man is plastered all over by small exquisitely executed paintings of personal family memories and small archive photos. A dichotomy of the dancer; the artist and his location: past and presence. This voluntary admittance of personal baggage is present in various disguises throughout the show, self referential in icons in the work of all five artists and in a centered and bordered installation, used as a steppingstone by Ellen Rodenberg. These plastic male figures, popular Eastern Asia strip cartoon icons holding aloft or facing the other side of visual cultural culture; the continuous acknowledgement by artists of art history. Their plastic colours of yellow and skin pink cause a disruption of otherwise too much good taste. I did find it quite interesting to note that as the only woman artist in the group EX-MÊKH Ellen Rodenberg finds her way through an installation; its components of wooden slats of art transport crates, Styrofoam packing cases, describing a confined constructed spatial rhythm in the exhibition space. 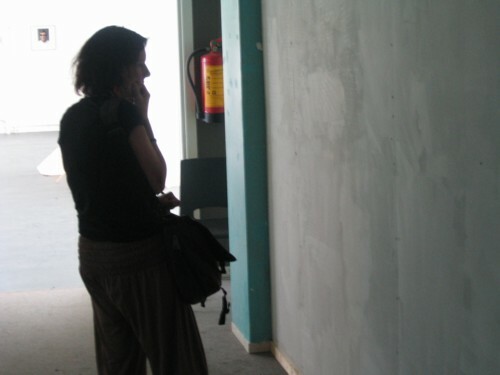 In the adjacent space her personal video account of the Indonesian residency can only be seen from a distance and is partially obscured by two flat painted sheets. Questioning and acknowledging again the flux of modernism today. The latter is brought to a full frontal confrontation by her remake of de Koonings’Woman’. A knowing malicious grin if ever I have seen one. I particularly like the prospect of the tempo rarity of this project as it develops. I can safely bet so very differently. My comments are going to follow this process very randomly and I guess for all involved the first hurdle has now been faced. The writing is intended to be spontaneous with bits to keep and bits to throw away. As is stated eventually all is a shadow. After a week’s absence, silence I enter the exhibition space of the follow -on presentation and am immediately struck; confronted on the left by five long sheets of kite-paper suspended in a previously clear space. I am stunned. Earlier, in the build up of the show, two paneled sheets were lying on the floor facing and reflecting the translucent light coming from the light and gray text ’all is shadow’ window and re-emphasized the content, light and the architecture of that space most beautifully * This intervention changes the entire concept of the previous presentation, which I guess now answers the question ‘ What is the difference between a group show and a collaborative presentation?’ This work by Hans Ensink op Kemma changes the identity, the vision and the entire concept of the previous presentation of inner and individual retrospection. That is not to say, I stress hereby that the work in it self does not add to these properties. You have to acknowledge its visual impact, its temporality. The solution of hanging this five-paneled modernity on a metal wire, reminiscent of a tightrope attached by wooden clothes pegs adds to the concept of the piece. The constructivist double sided partially overlapping painting hangs from nearly ceiling to floor and divides the space nearly from floor to ceiling, interestingly in the middle one of the sheets reaches and touches the ground The tightness of the grid interrupted by an irregularity of boundaries and demonstratively visibly taped edges of the coloured ‘squares’, the frayed torn edges of form, its luminosity, masking tape seams all these component details add and demand an impact. Colours in a composition of blues, brown (weight), soft greens, grays and yellows with a hard hit of orange. As you walk around the work it moves with you and responds in a gently swaying undulating movement. My issue and query lies with its positioning the entire work is too large for the space and does in itself as a total intersected moving crackling swaying luminous coloured piece deserves a larger premise. The consequent infiltrary factor unto the space and the relationship it has and will develop negates the property and view of this work. That to me seems a pity. Before I forget during the week thinking about the first part of Take Five it came to me the mind set work by Machiel van Soest is totally – question deliberate- non-gendered, there is no mention what so ever of bodily fluids, which from both male and female perspective is quite relevant. Back to the show and walking around and hearing the reassuring and intermittent striking of village church bells joined by the quiet chorus of the autonomous sound piece which binds and connects all these works so well. Maarten Schepers photograph high up on the wall of a glimpse of blue ever lasting Mediterranean sky divided by the vertical tops of pine trees and echoing the, now unseen, but heard and known so well still screen film of ‘Contemplation ‘. The unmoving and silent contemplator remains unaware of your presence behind him. . As a viewer however this time it is impossible to join and enter the space directly from behind him. Which actually says a great deal about the artist and his relationship to the viewer the recipient of a work as opposed to the other piece in the show, in which the artist literally invites and demands your participation in the culmination of the final piece of the work through your reflection in the mirror placed alongside the self-portrait. Underneath the Emergency exit sign, and again, straining my neck to see hangs Maarten Schepers news cut outs; a personal archive of newspaper photographs, curiously now by being removed from time and place; political actuality, cut out and framed behind glass they become a formal art arrangement of images. Yet they so poignantly converse and comment on the accuracy and credibility of the emotive power of the original visual image. As a memorable component of our view of ourselves, who we are and the world we inhabit at large. It links and nods sideways to Stijn Peeters’ painting where on its surface family snap-shots are transformed to scale into minutely executed and detailed paintings. The photographic images in both of these works are detached from and consequently changed from their original meaning. And equally this photographic work reaffirms the identity raised by the central installations ( Not Me) Ellen Rodenberg on the question of positioning of the artist, the work, the process and (historical) context. Next weekend the presentation (Take Five part three) is going to be so entirely different so in some sense I shall have to close the door and say my farewells to some very good friends. Yet at the same time I shall await the new in excited anticipation. *In the capacity of a commentator (and not a critic) it is allowed to write and use the word beautiful. 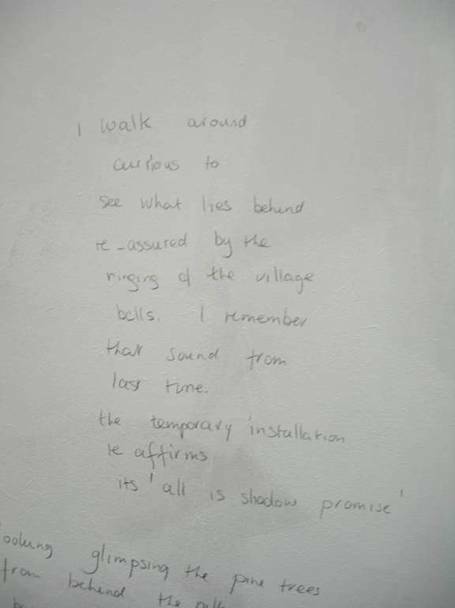 **Also of relevance is the spontaneous, slightly too poetical penciled and written on the spot comment on a wall of the corridor leading to the exhibition space. Tangent. As I am inclined to do! I was walking along the dimly lit corridor this third time around to enter the main exhibition space in Ruimtevaart and was vaguely aware of the penciled worded text wall, but my eyes were instantly drawn to and sucked into a display not dissimilar to a Matisse paper cutout. Inside the exhibition space it became apparent that this work was very much solid and three-dimensional. Suspended and spread out and hung high partially in the white shiny tiled alcove. A wonderful sea-underworld construction. Orange and cerulean blue tentacles stretched out and growing on these tentacles was what looked like a green slimy looking growth. Thin nylon lines suspended the forms and this playful construction was to continued and echoed in the graphic works on the adjoining wall(s). This installation by Marieke Klos could equally be imagined to be a coral reef; it invites you to see the invisible; in this case the deep and mysterious underwater world. The nylon lines made me look sideways towards the network of delicate, thin spidery lines in the drawings by Roeland Langendoen. The work in itself exudes light through a glaze of primary colours. In particular the middle one of these three connect back to the spatial construction by Ellen Rodenberg that occupied the centre stage in the previous Take Five presentations. Turning around across on the other side of the room first on the facing wall a golden glow of layered pencil markings so well constructed that the light resonates in a circle from its surface. Two further drawings are quietly beckoning. Densely worked; their appearance reminded me instantly of the ‘Contemplation’ video by Kees Koomen in the previous presentation. Images sprung to mind of leaves waving, glimpses of blue sky amidst a sun dappled landscape. It was a total surprise to discover so far how much of the previous two’ Take Five’ presentations tended to linger and resurface. I would like to think that not all is a coincidence and it is the result of a deliberate meditation by some of the artists in this particular part three collaboration of work. Turning on my heels and walking around, I cannot ignore and postpone this moment any longer; facing aloft stands a small but impressive wood paneled house or cabin; a shelter rose off the ground onto a platform. Next to it widely spread out is the top of a lonesome pine tree. Walking around underneath the plateau, which is divided by a support wall on three separate corners you discover grouped formations of containers and vessels each one demanding to be read as symbols and necessities of the origin of life. There placed and given to view through the intervention by Maarten Schepers. Uniformed sized books with black covers. Some moldy and mil dewed. A few books lying on top were or had been opened and given the appearance of being hastily abandoned by their owner. Empty aluminum pans; utility pots in a sculptural arrangement stacked or placed side by side. A single mattress with a dingy sheet thrown over the top, did someone sleep there or did Tracey* leave in a hurry? Or are we invited for a rest which upon a second visit the mattress was temporarily and spontaneously occupied by a tired and read out visitor, who did not just take five, but took a nap as well, which proves that good art communicates and demands participation on any level. This appearance of an archetypical house on a pedestal, aloft as an emblem. Tucked inside of the cabin blackened by soot burns a single wick light. The lone pine tree stuck on the wooden platform. The latter reminded me a bit, I don’t know why of the picture of Liam Gillick’s cat perched high up in the 2009 Venice Biennale. All these combined parts of this work add up as essential components to the continuance or origin of life; vessels and containers rendered dysfunctional and displayed and given a new meaning in their conjunction here brought together. What is so striking in this show is the level of audience participation either by invitation or otherwise spontaneous. Invited by the artists and their use of utility, everyday common objects. Mirrors are to be looked in, pots are lifted, mattresses are slept upon and books are opened and pages read and further in an untitled work by Nies Vooys a suspicious high consumption level of whisky .The bottle which is clamped to the wall is one part of a personal archive of memorabilia consisting of texts, images, photos, bits of lost curled tape and other miscellaneous objects. The collective memory referred to again through newspaper clippings tightly packaged and wrapped around the central column with yellow cellophane. A formulation of personal recollections, bits of news that appeared at the time and had to be preserved, cut out, stuck in time .You are drawn to look through the shiny plastic, read and surrender yourself to your own recollections. It is again a tribute how a specific personal memory becomes collective, shared by all. A black wig a round metal clamp suggesting an absence of limbs or bodies; mirrors, which capture moments of individual self-reflection. All found, random objects repositioned and to be seen through the generosity of the artist intuitive vision. Some of the items are positioned next to their paper image, the mirror with you in it next to a photo depicting the artist’s studio. The real and long flowing hair is placed next to news magazine photos of heads with wigs. The Malevich black and red cross resurrected from an article and continues in red tape mark at the top of the newspaper layers and creeps around the corner. The red rectangular Malevich shape is to be found again in the three- paneled work -from dawn till dusk- by Hans Ensink op Kemna. The red sanguine forms pulsating in a network of spaced bars that run parallel downwards. The reds are stained in visible brush strokes unto hand made paper and give an impression of rolled and crumpled rags, which have all been carefully collected and re-arranged, the light drawing through from behind. The work does hang a foot away from the window and is not to be viewed as a stained glass panel, but just as the word facing on the opposite side still etched on the window pane reminds you as the existentialist: is. All this time whilst walking around the all-invasive jazz tunes infiltrate the space not like the previous occasions when the individual sound tracks commuted a gentler note. No this higher pitch of reflection seems to be an even more literal interpretation of ‘Take five ‘ .A pervading jazz sound discordant at times; it is part of an installation of sound, object, image and film by the artist Barney de Krijger. In the adjoining darkened space a saxophone heightens the sound effect. Numerous small black balloons are expanding from all its orifices whilst the saxophone is playing on determinedly. It is projected against a film screen and you suddenly notice on the screened image of the saxophone in all their glory painted over the black balloons names of jazz musicians. The balloons viewed s carriers and messengers for the heroes of the age of jazz music. The object of a saxophone manifested in full glory on the screen behind; a telling tribute to the highlights of the golden age of jazz. Barney de Krijger also demonstrated in his film piece a passionate display for his mentors and heroes, who unfortunately popped and exploded, disappeared from view as can happen in real life only to make a renewed appearance seconds later. The icon of a playing golden saxophone with its protruding balloons on the screen was caught again in the window at the side in an additional moment of a captured reflection. This double layer of a literal reflection was also the case of the installation of tentacles just around the corner as the light faded that evening a shiny deep shadow danced behind this still network of tentacles. The theme of reflection pervaded in this collaboration, purposely or coincidentally, who knows! The collaborative response to each others work in this episode three was clearly demonstrated in my view. Perhaps this was due to intensive discussions beforehand between the artists. The connecting thread that one could pull to the previous presentations. References were made visible in concept and or context. In the flow of conversations with some of the artists these touch points were instantly mentioned and acknowledgements were made to the previous ‘Take Five’ shows. In the current week of silence and partially non activity this particular presentation of work can stay and just be, they can get used to each other- to be ready for us to face us the scrutinizing viewer again and then again to be disrupted, intervened through additional visual contributions by the two other (EX)- MÊKH members for part four. The single word-text will remain on the windowpane. Silently, still. Part four with (re)-newed contributions by Ellen Rodenberg and Kees Koomen. It becomes immediately apparent that the’ inside and outside’ theme of Take Five episode three is quite strictly adhered with a noticeable narrative content in this Take four by both the invited guest Machiel van Soest and the new work by Ellen en Kees. The grounded on floorlevel contributions and a low viewing perspective continues drastically interrupted with some high up well positioned and expanding works. I rather expect it by now that on the second takes I immediately find that I am drawn to either previous favourite points or just that bit of work, which would not let go. Still framed by the main entrance to the exhibition the work by Marieke Klos; retains its strength and visual pull on aproach from a lengthy distance; on closer scrutiny I discover that an aging process has taken place in just one weeks time. The tentacle forms have shrunk and withered at their very ends. Involuntarily the thematic bind to the show has been extended; the shiny surface has retracted; the outside end bits have curled up and are tucked up inside due to the inherent conditions of the property of the material used and thus givinga new time dimension.to read the piece. Ellen Rodenberg in Borderlines’ makes the inside and the outside most obviously visible through the interplay of a spatial separation. On four corners solid wooden blocks supporting thin slats of wood installation; a probing self determined and newly marked parrameters rose from the floor. Horizontally stretched out, off-shaped square, just a few delicately balanced pieces of thin wood describing a confined area, a distinct seperated bordered territory. I noticed on the ground a very relevant, but nevertheless easily erasable chalk line as a divide. A marker to where perhaps a new obstruction will be placed or maybe there to indicate the interim nature of this personally claimed space. The wooden slat or stick placed against the near window as a pointer to the word ‘is resembles a flimsy barricade to stop the outside from entering; it does to me appear superfluous and distracting from the muted opaque glass wall. Adjacent a painting by Machiel van Soest in which the paints marks appear pulled from underneath the picture surface, the outside layer of skin. The inside made visible by thin threads of colour. With an undeniable confrontational, but speechless address to the viewer there stands a looped video by Kees Koomen projected from the bottom edge of the wall towards you, and the floor you find yourself standing on. A simple still image of a face and shoulders framed by, I happened to notice and further like, slightly frayed at the edges white t-shirt. The expressive face is looking at you and touchingly demonstrating to you basic emotions in a slowed down motion giving you enough the time to enter into a maybe involuntary responsive dialogue. 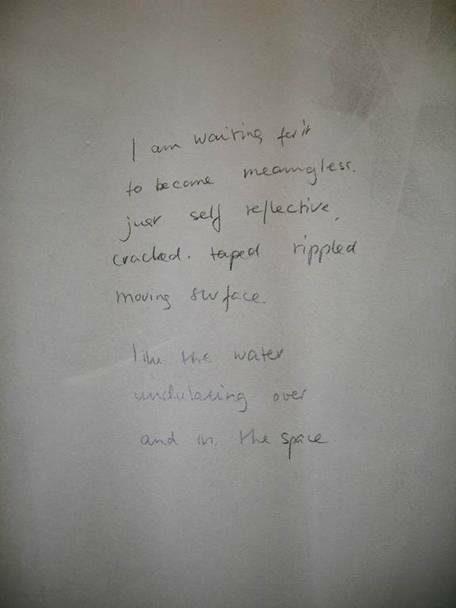 These few immediate basic emotions were so reminiscent of my own frowning articulations whilst concentrating and writing on the text wall, the difference being I stand with my back turned to the wall quite deliberately so and the video acknowledges and needs the presence of a face to face contact and confrontational view. Soundless soliloquies. Eloquent yet mutant, but not like a mask, although that could be implied, the inside quite clearly here becomes the outside. Ellen Rodenberg in’ Cross’ traversing and dividing a horizontally construction thick bamboo cross formation placed just so to stop the viewer in their stride, renegotiate the space placed to counteract the over domineering vertical*, I shall definitely not explore the notion of three deities or any other Christian religious popular overtone that comes to mind here a, in this case a single act of recognition and consequent intervention is any woman’s prerogative. Over the entrance dividing the spaces hangs a small painting positions high up another straining of the neck exercise quite fitting as the screen on closer scrutiny appears to be overhead security camera with even shows the exact second of time. A small painting of a grey non-descript interior (perhaps parking garage) in which a singular dark figure enters. A singular white paint streak connecting quite deliberately the inside of the screen with outside our observed and consequently imaged registered world. Similar to what the artist does to observe and show the unobserved. The saxophone played on tirelessly, breath in breath out producing notes; some fell unto the floor and re-arranged themselves. 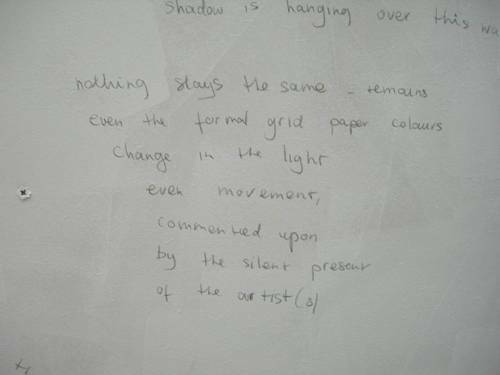 White folded secretive bits of paper; I opened one and then one and one again, inside the author had revealed notes and anecdotes from her art own practice some of which, also in this work, linking to unsung or unseen heroes. Carefully they were returned to their original spot, just there where they were so precisely arranged in a quiet display. 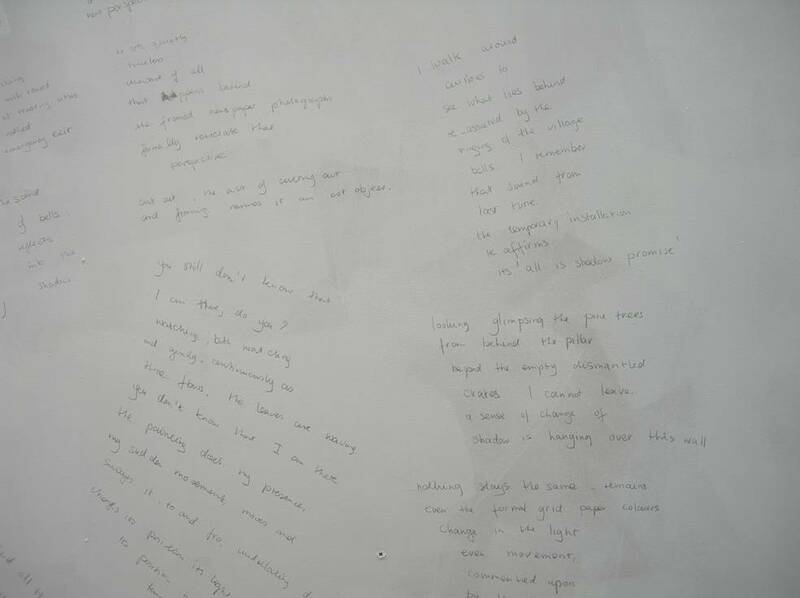 Attempts of participation or interaction by the viewer to pick up the folded pieces of paper and find out whether there is writing hidden were few and far between and at best tentative. Perhaps partly due to the fact that art viewing behaviour is conditioned and instinctively adjusted to this separate white cube space. 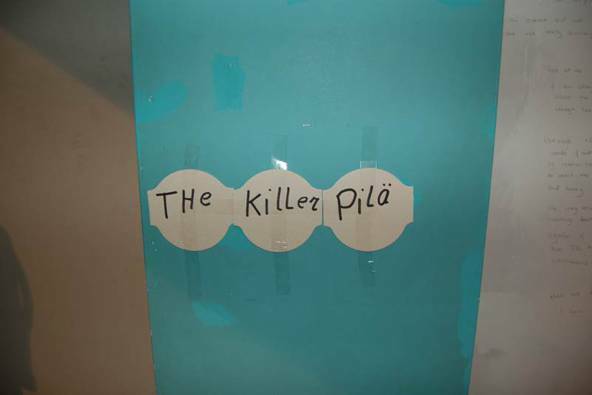 The respect which is shown towards the formal arrangement, the private handwritten note, not based on or unaware of content as opposed to the general response to Maarten Schepers installation. The audience demonstrated an unknown hesitance and respect towards the personal hand written notes; they were not easily opened and read. Yet the book or even the aluminium pans for that matter seen in a pubic domain are picked up, scrutinized, used at whatever personal level only to be put down again at random fashion irregardless as towhatever shape or form it was in before, the formal sculptural arrangement easily disrupted. A few purely pictorial images will remain in my mind for quite some time I am sure: the yellow cellophane covered text and images stifling and perhaps even deliberately silencing the words, the light in the proverbial house, blackened inside and dark books outside, a face looking puzzled frowning to only break into a knowing smile; red falling paper perhaps one stained on the inside now visible through all the layers. An efferescent yellow paper circle to a dark clamped wig. I have been fortunate to be part of some of the artist’s group discussions and became to understand the initial need and formative background to form (EX)-MÊKH. Which is why I would like to pose the question to all of us now this reader, the participant, the viewer what have we all individually and collectively taken with us just for ourselves from the Take Five’s and best of all what would we like to imagine for Episode five? 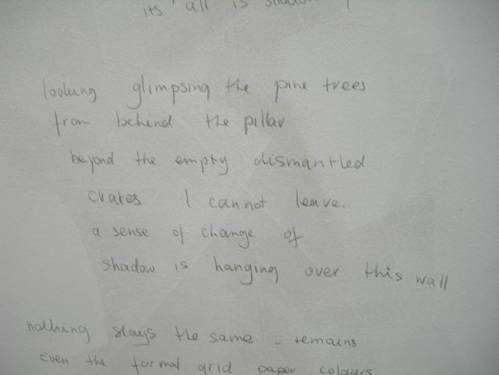 The penciled text wall has come to its natural end too; this temporary personal observation, so visible and accessible. Maybe some things need to remain quietly hidden and unobtrusive. Just hinting on the outside surface to that what lies underneath; just like the Take One’s to Four’s s have done. *implication purely to the formal format of the work not the visual image nor content. And a re-appearance by the invited guests: Barney de Krijger,G.J de Rook, Marieke Klos, Nies van Nooij, Machiel van Soest, Roeland Langendoen en Stijn Peeters. The premise of this take five was an influential and consequent new (err) work by the (EX)-Mekh artists with new additions of new work by the invited guests. The first thing that struck me in the fifth Take Five presentation that there was not a sound noise of any kind to be heard; no clocks, bells or a tropical sound recording, no jazz notes ringing in your ears. Absolute silence hung like a descending mist over the space. Whilst standing there in the midst of it all it reminded me of the total eclipse of the sun years ago: that moment when your breath halters stops in anticipation, light fades gradually until dusk and darkness fall. From one moment to another the world around you is still and time seems to stop just briefly. Then one silhouette slowly glides across another, gradually changes what you see, covers it and disappears again. Within minutes to return to dawn and full light again and the world around us goes back to normal. All is clear and visible again. That was the Take Five – five presentations. Now with this new appearance of work it appears to be an impossible task to begin to describe each and every single one realistically, there is so much to notice. Let it be suffice to emphasize that the entire presentation rests on the unique coming together of all these irreplaceable voices. A monologue of individual work, which in turn presents an overwhelming sense of nostalgia, but also quietly conversing with one and other under the scrutiny of an observant eye. There has recently been a spade of exhibitions, a tendency in the arts circuit to curate an exhibition based on an odd or early work from the artists career or to pick that one pivotal work unfamiliar to the public, but which demonstrates an influence, which becomes on seeing the work, immediately recognizable. Take Five; episode five has followed this line of thinking; the four (EX)-Mekh members have all selected an individual work that connects or leads to recent crucial developments in their arts practise. It has been interesting for me to find the unexpected views and details in both the formal in relation to the individual works and in the overall display of work. It links and jumps well from one to another again through formal or contents associations to the unexpected view within the architectural space. Peep through the cracks and turn your head slightly from one work to another or to look sideways and underneath. Defying a view point that ‘clarity is fake’. I found and noticed that the Mind maps this time presented on the white laboratory tiled background delved much further within; both analytically and emotivelyin content. Which was strengthened by the mind mapping painting, which enveloped future and past essential elements; pointing fervently to the way forward; a dazzling array of perspectives, jumping and racing across the surface to finally descend from the painted frame and tumble onto a floor or wall and manifest themselves into multi-faceted construction. Underneath the beguiling sensuous folds and articulation points, which fastened the work to the wall was a hidden edgy political comment. The surprising and hidden manifested itself in all the works described to follow here: as paint and sculptural elements met in a waxy sumptuously glimmering textured surface. Stretched out over a three-part metal structure. The oval surface cuts offered an unexpected look inside, the underneath and the adjacent upturned inverted container, which could literally catch the waxy, drips emanating from the cover surface. An Eighties in triptych tightly framed, fervent paint swerving and pointing the way forward. Side by side to the heavy trod of a man in a Dutch southern lit landscape with two blue buckets placed by his side; one full, one half empty with a red sticker on his forehead commenting on the conceptual and the commercial criteria which the artist grapples with. Colour grid spread out on the floor like a intersection of a New York Street plan heading towards the projected black and white film where we walk very slowly underneath the Roman arches of an arena. An intense bright light falls through the arches each time we slowly follow the camera on its light intermittent circular route and imagining our echoing footsteps. To a grey dull cement washed surface; a heavy weight dragging down the four arms of the octopus to the floor with the fifth arm ambling aimlessly behind. Peering through the tentacles a thronged heap of electrical wiring is spilling out from a suspended metal-framed house. Attached to the wall a metal bracket, resembling a medical arm sticking our awkwardly holding a glass plate suspended in the metal house construction from which electrical wiring spills over, rendered useless, defunct. on each one of us who participated. That also includes the viewer and the reader of this text. We will have brought something and taken something away to be used later.